Happy Friday! I hope you've got some great plans for the weekend, that way I can vicariously live through you while I'm working on Saturday. Aside from work, it's my five year wedding anniversary and we're planning on going to one of Roy Choi's restaurants for dinner. I'm really looking forward to it because I've been seeing so much of his food on tv lately. I have another fantastic dark teal for you today, and that is Illamasqua's Venous. 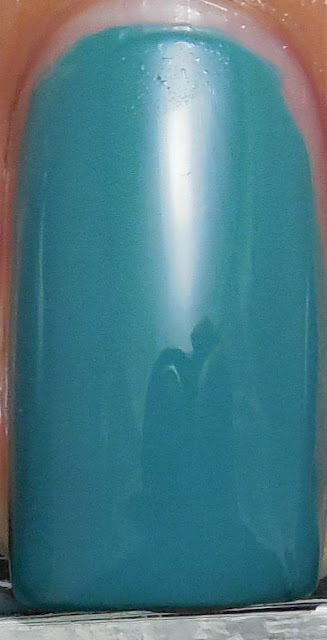 It's a dark green leaning teal cream that had a superb formula. With absolutely no issues with application, this polish nearly painted itself on my nails. I almost got away with one coat but used two to be safe and then finished with a layer of Poshe. And as promised, I have a comparison of Illamasqua Venous, YSL Vert D'Orient, and China Glaze Exotic Encounters. As you can see, Venous and Vert D'Orient are closer in shade than Exotic Encounters. EE leans more darker and dusty. Application-wise, China Glaze was streaky and thinner than either YSL or Illamasqua, but Illamasqua wins hands down in formula and ease of application. The YSL was a bit thicker and didn't self level at all, unlike the Illa that smoothed itself out. I'll keep looking for a cheaper alternative, but if you like this shade of teal, I definitely recommend the Illa over the other brands.